I'm not usually a horror reader, but I will make an exception for Ania Ahlborn every single chance I get. 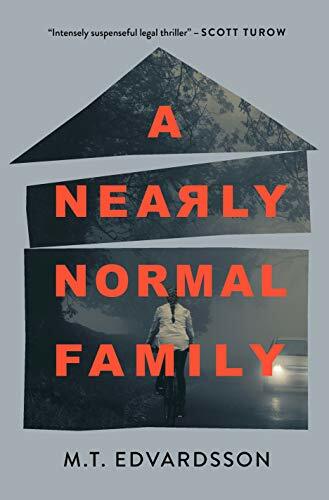 I first read Ania's work last Halloween, when I picked up a copy of BROTHER - and fell completely in love with her modern, intelligent brand of horror writing. More than just terrifying, Ania's books are richly-developed, beautifully-written stories. You'll come for the scares, and stay for their vivid characters and plots. To my mind, Ania is defining a new generation of horror—and when you read her books, I'm betting you'll agree. I'm thrilled to share a Q&A with Ania about her brand-new horror novel THE DEVIL CREPT IN (on sale 2/7/17). I read and loved THE DEVIL CREPT IN just a few weeks ago—you can read my full review of this chilling horror story here. This Q&A has to be one of my personal favorites—Ania's responses to my questions prove she's a woman after my own heart! Her personality and thoughtfulness truly make this such a fun and fascinating read. Thank you so much to Ania for taking the time to answer my questions! Read on for insight into THE DEVIL CREPT IN, how the horror genre "chose" Ania, and much more. About the Author: Ania Ahlborn is the bestselling author of the horror thrillers Brother, Within These Walls, The Bird Eater, The Shuddering, The Neighbors, and Seed, and the novella The Pretty Ones. Born in Ciechanow, Poland, she lives in South Carolina with her husband and their dog. VisitAniaAhlborn.com or follow the author on Facebook and Twitter @AniaAhlbornAuthor. Crime by the Book: If you could describe THE DEVIL CREPT IN in 3 adjectives, what would they be? Ania Ahlborn: Wow, a tough question right out of the gate! Three adjectives...hmm. Sinister, harrowing, and tragic. Always, always tragic. AA: Well, when I was a kid and went missing myself... (ba-dum-pum) No, but seriously. I've always found the concept of a child going missing both terrifying and fascinating. On one side, you have the grief the family goes through, the fear of "where's my baby?" On the other, where's the kid, and what's he going through? Who took him? And if he escapes, will he ever be the same again? I knew I wanted to make that the central part of my story while also pulling in the terror of the family that's in the midst of a very real nightmare. DEVIL is what ended up coming to be. CBTB: Without spoiling anything, DEVIL has a really dark and disturbing figure at its center. How did you get into the head of such a twisted character? Does it ever become too much, writing about a character like that? AA: The motto I live by when I write is: every character is his own hero. Especially the bad guys. My books are character-driven, so I have to weasel my way into some pretty gruesome mindsets. But, I'm the type of girl who can read a news article about atrocious things and find a way to empathize with the lowest denominator. Gift, curse? I don't know, I guess it could be both. But yeah, sometimes getting into and staying withing those mindsets can get tiring. As a reader, you can blow through a book in a few days; but as an author, you're stuck with these characters for months, sometimes years. Every so often, when the words aren't flowing as freely as they should, I think, "man, I could be writing about puppies right now!" But, knowing me, those puppies would end up as baby Cujos or something. I can't not make stuff dark. It's a character flaw. A compulsion, I guess. CBTB: One of my favorite aspects of DEVIL was how you find a balance between horror that’s otherworldly, and horror that’s very man-made. Yes, what Stevie found in the forest was terrifying… but his family situation wasn’t much better. Was this planned? Did it develop naturally? I’d love to know a bit more about how you find that balance. AA: My favorite monster is the one that lives in your house, or down your street, or happens to deliver your mail or pick up your trash. I love writing about people far more than about spooky stuff out in the woods, because horror isn't about the things we're afraid of, it's about how we react when we're facing our worst nightmare. For me, Stevie's personal torment--his abusive stepdad, with his avoidant mother--all of that is tapping into the reader's own experiences. That's the thing with a good horror novel, or even a movie; you care about the character, you don't want them to get axed. Achieving that level of empathy takes a bit of planning, but for the most part, the character develops organically as I move from one draft to the next. You just keep layering the details until you have as close to a living, breathing human being as you can on that page. CBTB: Your writing is absolutely beautiful, and could easily be applied to any kind of fiction. Why choose to write horror? What do you think draws you to these dark stories? AA: Horror wasn't a "choice" for me. If anything--and as creepy as this is going to sound--horror chose me. I can't remember a time when I didn't like weird and spooky things. As a little kid, I adored horror movies despite them scaring the bejesus out of me. I was always pointing out cemeteries and creepy old houses to my parents; I still do that to this day, except now, I point them out to my husband instead. When I was little, we lived in this eerie A-frame house, and for some reason I convinced myself there were ghosts living upstairs, if only to have the privilege of living in a haunted house. Most kids actively avoid living with ghosts, but there I was. Yep. Haunted. Hurray! This stuff is just who I am; there's something in my blood that turns everything dark. And while that makes it sound like I'm some sort of sad and brooding Morticia Addams, banging out my books on an antique typewriter while streaming harpsichord music on my phone (is there a Spotify playlist for that? ), nothing could be further from the truth. I get all that dark stuff out onto the page, and then...well, puppies. And baking. And, okay, fine, horror movies... but you get the idea. AA: As a woman in a male-dominated genre, there's definitely a sense of needing to prove yourself. That just comes with the territory. But it wasn't something that scared me off. As far as unique challenges go, I can't really think of any. If anything, once I got my footing, readers really embraced me for what I was doing. But, again, I won't say they embraced me because I was a woman, either. I think that, with the horror crowd, if you do good by them, if you tell a killer story, they're going to lift you up. Of the folks I've met, they're an incredible, supportive group. CBTB: Who are some of your personal favorite horror writers? Any must-read female horror authors you would recommend? AA: Well, as generic as it'll make me sound, Stephen King is my main squeeze. I just love the cadence to his writing. It's like a warm blanket on a cold day. Ira Levin, John A. Lindqvist, Joe Hill, Robert Bloch. As far as the ladies go, Gillian Flynn isn't exactly horror, but I adore her. Anne Rice is one of the original trailblazers. Both she and Poppy Z. Brite, while not for everyone, were huge influences on a younger, more innocent me. CBTB: What was the best horror book you read in the past year (or so)? AA: I probably read more non-horror books than horror, but...does YOU by Caroline Kepnes count? Love that. THE DAMNED by Andrew Pyper was gorgeous. It gave me author envy; like, "why didn't I write this?" And I really did enjoy King's THE BAZAAR OF BAD DREAMS. But FULL DARK, NO STARS still remains my all-time favorite story collection of his. If you haven't read it, do so. You'll understand why it speaks to me if you do. Thank you so much to Ania for taking the time to answer my questions! I'm thrilled to have the chance to share this Q&A with you, and hope that you've found it as fascinating as I have. I highly recommend THE DEVIL CREPT IN for both seasoned horror readers and those new to the genre.